I’m so proud of this finish! I was taking the last couple stitches on the binding and I couldn’t wait to spread it out and get a look at it all complete… Yay! As most of you know, I’ve been working on this quilt all year, and I’m feeling pretty proud of how it’s come out! 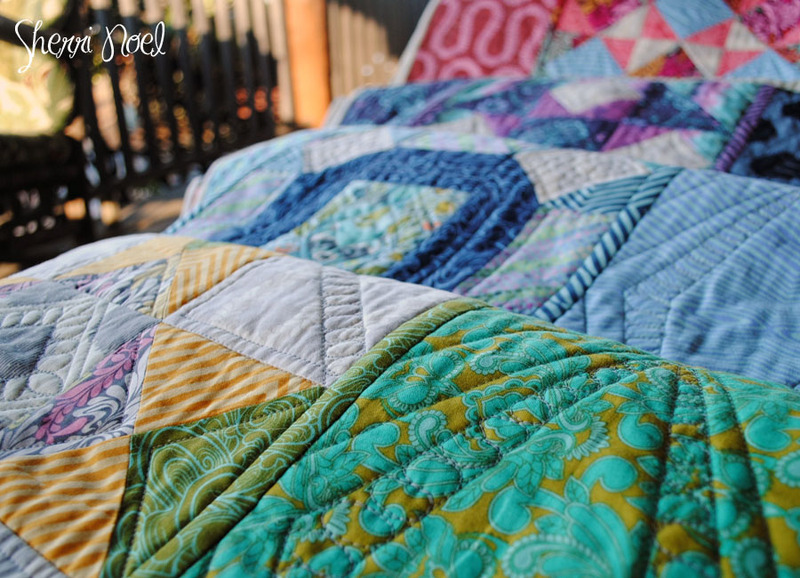 I usually struggle with a quilting plan ~ and sometimes the thought of quilting a large quilt top on my domestic machine makes me a bit anxious (will I totally mess up all my hard work trying to quilt it?) This is why I probably love hand quilting so much. 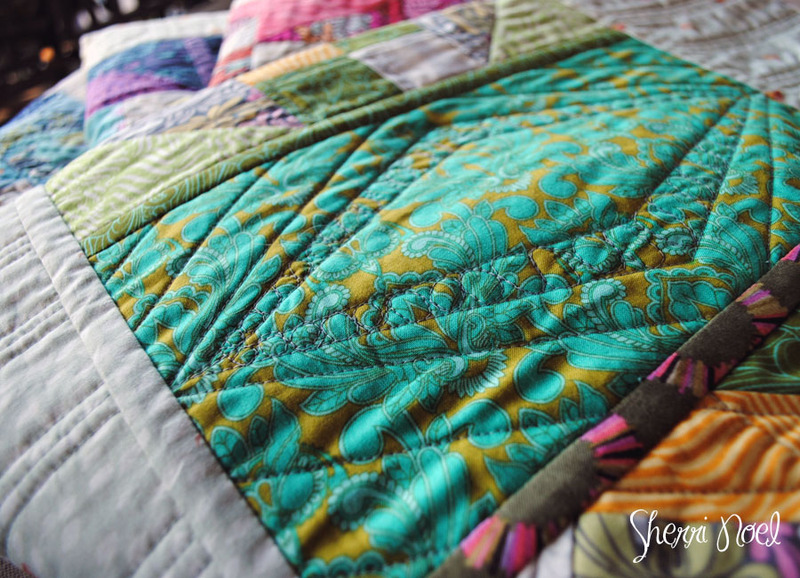 But using the quilt as you go method and quilting one block at a time, my quilt is now custom quilted, and that’s pretty darn good! I want to share one last tip about putting together all the rows. 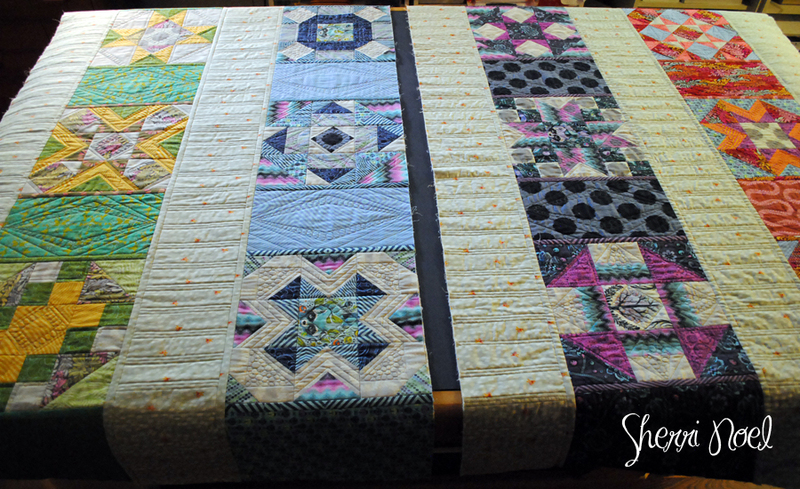 When you’re joining your rows, join them in two smaller sections so it’s easier to manage sewing all the sashing strips on and then when you have the two sections complete, go ahead and join them to finish the quilt. This way you don’t have to handle all the bulk until the last joining seam. If you’re just joining in, here are the previous quilt~as~you~go posts: Part 1, Part 2, Part 3, Part 4, Part 5. And you can find the pattern in my shop. After the rows are all joined all you have left is the binding! a couple more close ups of the front! Remember the planning we did for the back of each block in this post? Well it paid off! Look at all that color, it’s so fun! ? 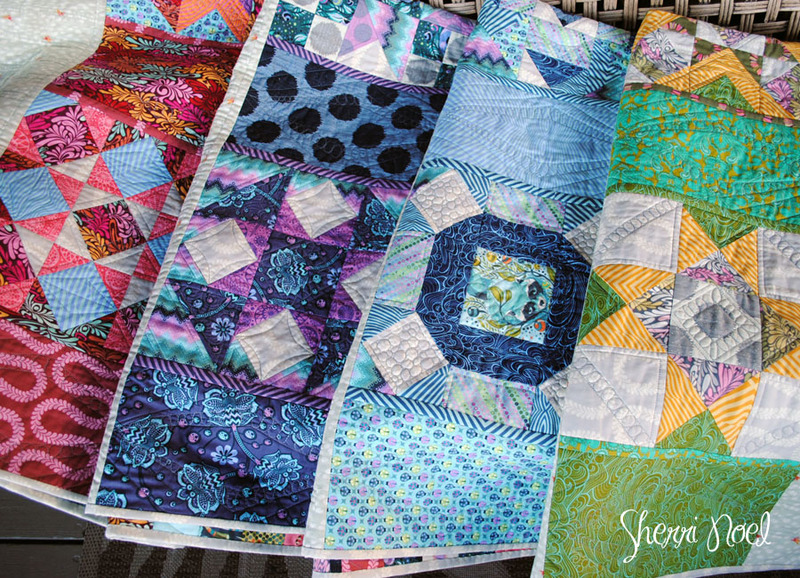 Thanks so much for following along with all the quilt as you go posts! I hope you enjoyed it as much as I did and maybe you even learned something new! That is beautiful!!! I’ve always wanted to do a quilt as you go. I’m saving your links above. WOW! I love this quilt. 2 quilts in 1 and done! Definitely going on my 2016 to-do list! !! Beautiful work & inspiring. I’m in awe! I didn’t find you in time to follow along, but I just found some quilt blocks my SILs mom pieced before she passed away. I do believe I will incorporate your method/tutorials into finishing these blocks into a top as a surprise! Thanks so much! That came out amazing! All the colors are so pretty! I can’t wait to get back to mine after the holidays! Half done! Thanks so much for the great tutorials! Not too many photos at all–and you have truly earned a much more than “pretty proud” for this! 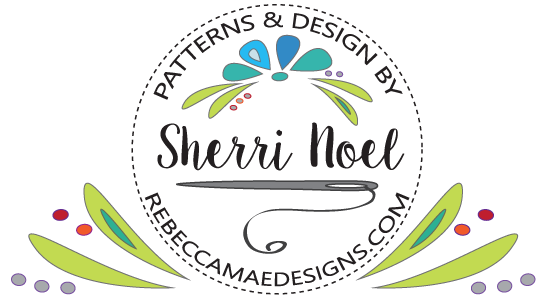 What a great way to close out 2015, Sherri! You did very good job on you quilt.lt is beautiful. Rebecca, it looks amazing. Well done. I’ve started mine. But wasn’t sure whether to QAG or wait and do it all in one end. I, glad I’ve waited – I’m now going to QAG. Love the back – I just could visualise it,, so have loved seeing it all finished. I’m off – it’s going to be my 2016 finish. I’ll send you pics. 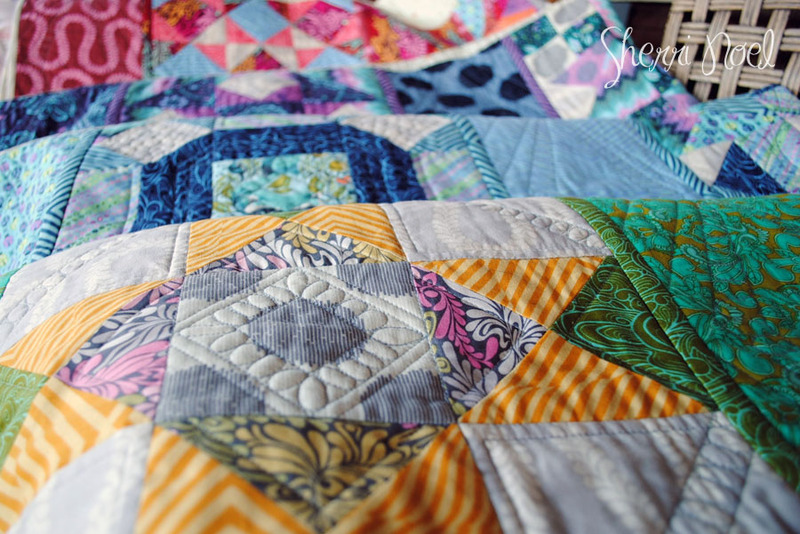 This quilt is EXQUISITE! I just found it and have spent the entire evening reading through all your tutorials explaining the whole process. I will definitely make it using your QAYG ideas. 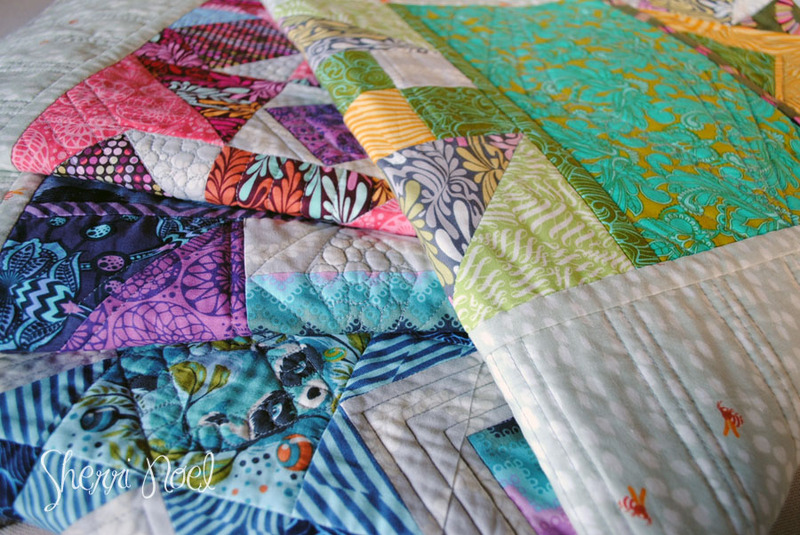 I love the bright, happy colors and the sashing using scraps. The finished result is AMAZING! Wow…I’m impressed with the joyfulness of it! Ok….just a few more thoughts. The back of the quilt is almost MORE FABULOUS than the front if that’s even possible. I am determined NOT to send my quilts out to be quilted, but the quilting is the most tedious and I satisfying part of the quilt. 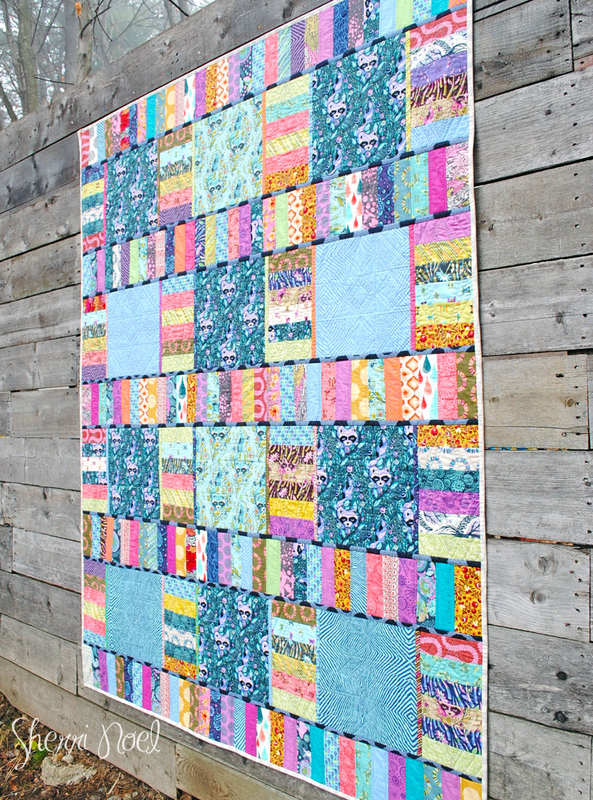 This quilt and your imaginative use of colors in the sashing and backing are really exciting. Many many thanks! I am a seamstress (dressmaker) and recently retired from teaching. I have been sewing all my life — almost 60 years – as a dressmaker – but am finding info on the internet so very, very interesting. I have always wanted to add quilting to my talents, but limited as I was raising a family and working outside of my home. Now that I am retired, I have reopened my doors as a dressmaker, but find that I have time (no kids) and have incorporated quilting into my dreams and wishes. I have started a quilt and have watched various versions of quilt as you go, but your instructions are so clear and precise. I am going to save your tutorial in case I lose total senses and need to refresh my memory. Thanks so much. 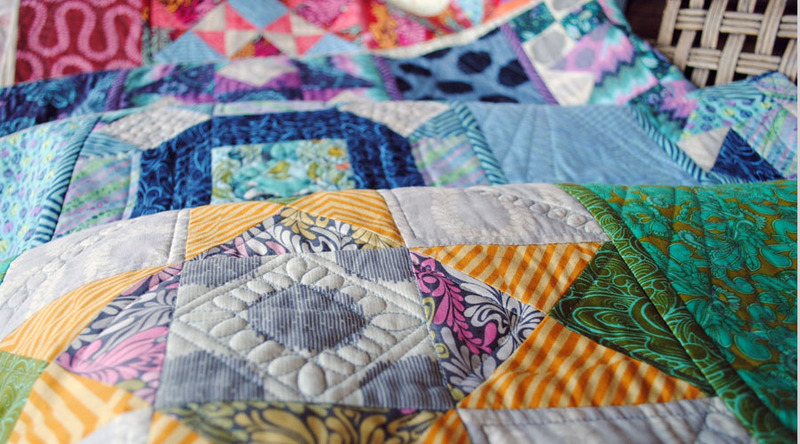 Yes, your quilt is very colorful and beautiful!